Despite having a manually height adjustable pallet lifter, a host of manual handling issues remained on a bottle packing line. Problems were encountered with moving the pallet lifter; the pallets of unlabelled bottles and transferring bottle trays to the turntable supplying the labeller. 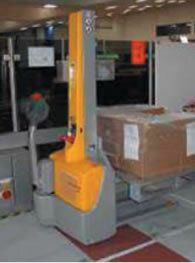 Limited space on line and in the production area meant turning the manual pallet lifter was very difficult and to do so operators often pushed the pallet forks with their feet or pulled with their arms. Significant force, up to 17kg, was required to move and turn the pallet lifter when full (up to 385 kg) while up to 14kg was required to pump the pallet up to the correct working height. This put operators at an increased risk of strain to their back and upper limbs. In addition, the pallet was not always adjusted to the correct height as doing so involved walking around to the other side of the lifter. This led to operators bending down and stretching to transfer trays resulting in greater risk of injury. Subsequent modification of the line layout reduced the labeller operation to a one person task but the redesign did not create any extra working space. Following a truck selection process involving three suppliers, an electric truck was purchased. This is not only light and easy to use but can also be turned in a restricted space. The truck, which is re-charged on line via a 240V socket and has a single mast permitting optimum visibility, has been fitted with shorter forks and an automatic height selector. Risk assessment and feedback indicates that the electric truck significantly improved the ergonomic issue relating to the risk of strain to arms and shoulders previously encountered; this seems to be mainly due to the lightness of the truck and greater ease of use. A safer manoeuvre without the need to ‘manhandle’ the truck and the discomfort experienced by smaller team operators on line has been removed. The automatic height sensor on the truck means the correct pallet height is constantly maintained when trays are being unloaded, eliminating the need for the operator to bend down to reach them or to go around the back of the unit to raise it up. This solution is not only beneficial to the operator in terms of health and safety, but also increases the overall efficiency of the operation.